TV-serie med Michael Chiklis och Walton Goggins. After a rocky start, Detective Vic Mackey and Captain David Aceveda have formed an uneasy alliance that Detective Claudette Wyms is determined to destroy. Vic's personal life is in shambles and a new nemesis on the street forces the Strike Team to risk everything in the pursuit of one last big score for their “retirement fund”. 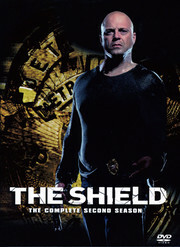 “The Shield” made history with the most Emmy® nominations ever for a basic cable drama. It won a Golden Globe for Best Drama Series and star Michael Chiklis won both the Emmy® and Golden Globe awards® for Lead Actor in a Drama Series. Brace yourself for a powerful second season that's even edgier and more in-your-face than the first. 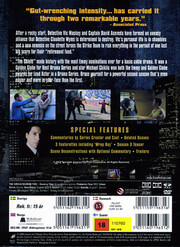 3 Featurettes including "Wrap Day"